This is part 2 (of 2) of a paper I wrote for the AGI in the UK on the future of location based services, which I have been meaning to publish for a while! This was for their "Foresight Study" to look at where the geospatial industry will be in five years' time. Please read part 1 first! Based on all these assumptions, we will have the ability to know where more or less everyone is, all the time – but with individuals having control over which people and applications can know their location, at what time. As with managing social network connections, users will be able to manage a common set of location sharing rules that are used by all applications. For example, work related applications may only be able to access a person’s location during working hours, certain applications or people may only be able to access an approximate location rather than a precise one, and so on. This will be integrated with the more general methods for managing sharing of information with groups of friends / business contacts (so for example you can set a location sharing policy with groups of people defined in other systems like Facebook or LinkedIn). There will also be widespread mechanisms for determining where you are more precisely than can be done with a GPS (or in situations where GPS does not work well, for example indoors). As mentioned previously, a common one will be using one or more kinds of proximity sensor. Image processing will be significant also – for example it will be commonplace to point a phone’s camera at a building, identify the building in question and give the user relevant information about that building, such as businesses within it, etc. This is a fairly straightforward combination of current technology categories. The first category is “simple” augmented reality systems like Layar, which are based on knowing the location and orientation of a phone (and overlaying data on a video image produced by the phone). The second category is technologies like PhotoSynth and Google Streetview’s new user photo capabilities, which match items such as buildings from different images (as well as having a geo-referenced set of base images). Combining these two areas will result in much more accurate augmented reality capabilities. In general with most location services there is a requirement to provide them based on where you are now, but also in many cases based on where you will be in the future. I may want to find a restaurant to eat at right now, or I may want to find somewhere to make a reservation for dinner in the city I will be in tomorrow night. This can be done manually of course, but we will also see increasing integration with calendars, travel reservation systems, etc, to build a model of a user’s future location and enable applications around that. Location aware phones will be a massive source of crowdsourced data, using both passive and active approaches. Passive approaches – automatic uploading of location data periodically – can be used for things like determining real time speed on roads (and footpaths, cycle paths, etc). Passively captured data can also be used to identify likely changes to road networks or other geospatial data – for example if lots of people are travelling at 30+ mph along a path where there is no recorded road in the database, that is probably a sign that there is a new road there. And conversely if a normally busy road suddenly has no traffic then it is probably closed. Active approaches to crowdsourced data will be discussed in the scenario section. This section includes a few examples of potential usage of the technologies discussed previously. There will be widely available services to make suggestions to people on what to do in a given location – combining highly detailed location data with huge amounts of user created data on restaurants, bars, music venues, bands, and so on. Technologies like Amazon’s recommendation engine very much apply here, to look at what other “people like you” like in this area (based on explicit information you provide – “I like sushi” – or implicit information derived from other places you have been, or restaurants you have rated highly, etc). As mentioned previously, there is a requirement to provide this type of service not just based on where you are now, but where you will be in the future. This will also be a commonplace capability in 5 years – there will be many systems to help with planning trips in a very personalized and detailed fashion. Location based social planning tools will grow enormously in usage as smart phones and social network usage become pervasive. Currently there are a number of applications that show where your friends are now but they have relatively low adoption, which means that they are still more at the novelty stage rather than being genuinely useful for most people. This will change dramatically over the next 5 years. Crowdsourced geodata creation has huge momentum at the moment, with OpenStreetMap being the most notable example. Easy to use tools on smartphones will make this even more prevalent, especially for simple items like points of interest. More active mappers will use tools that make requests proactively – for example they might get an alert that OpenStreetMap is not sure whether the street they are currently on (or are close to) is correctly named, so please could they validate it. We will also see significant growth in real time crowdsourced data – for example current gas / petrol prices, how long is the wait for a table at a given restaurant, etc. Car insurance companies will offer discounts for users who participate in “safe driver” programs, where the driver agrees that if her car exceeds the speed limit, this information will be passed back to the insurance company, with penalties resulting when certain thresholds are exceeded (in terms of amount by which the speed limit is exceeded, number of incidents, etc). In the enterprise, we will see a huge growth in the use of location-based services, driven by their widespread adoption in the mainstream consumer world. Currently most enterprise applications involving location tracking tend to be specialised niche applications, often on specialised hardware like rugged tablet PCs. This is likely to change to make much greater use of mainstream devices like the iPhone, and using commercial services to store and display location information. This is likely to impact the enterprise in two broad areas: one is that mobile / field based workers will have much better and simpler access to information, using the type of location-based services already mentioned. And the enterprise will have a real time picture of where all its employees are (as well as other resources and assets). Traditionally geospatial applications have been more about documenting and analysing the past, and planning for the future, but there will be significant growth in applications focused on real time information. This will also be driven by other sensor-based information. For example, utilities are seeing significant growth in intelligent sensors on their networks, especially in the electric industry where there is a strong focus on building the “smart grid”. A combination of sensors on the network and location tracking of employees, vehicles and assets will give electric utilities much greater visibility of their operations than they have today. Location tracking will be pervasive in 2014 – all mobile phones will have location tracking, and current limitations like inability to run applications in the background will have been addressed. Compasses and cameras will be fused with GPS to provide much greater context around the user’s location (and orientation). We will have the ability to know where everyone is all the time (with appropriate ways for people to limit access to their location in various ways). Location aware smartphones will create an enormous amount of free and accurate crowdsourced data, both relatively static (road networks, points of interest) and very dynamic (traffic speeds, gas prices, restaurant waiting times). Mainstream consumer-focused location aware smartphones and related location based services will make significant inroads into the enterprise, significantly reducing the cost and effort required for many mobile applications. This will provide better tools for mobile / field workers, and an increased emphasis on real time geospatial applications for many enterprises. While current location is extremely useful for many applications, future location is also very useful, and there will be an infrastructure in place for applications based on future location in addition to current location . An important area of focus should be developing appropriate policies and laws around sharing of an individual’s location information. We cannot just stop the advance of technology, and there is a danger that the technology is advancing much faster than policy in this area. This would be a good area for the AGI to add value, by initiating / encouraging work on policy and legal issues. I am sure most readers of this blog have heard about how there has been a huge effort to map Haiti using OpenStreetMap - Harry Wood gave a good summary of efforts a few weeks ago. Currently Schuyler Erle and Tom Buckley are down in Haiti helping out with mapping for the relief efforts on ground - Schuyler's blog has really interesting accounts of what they've been doing. Schuyler tweeted today that he and Tom were "starting to post raw, iffy quality, unedited audio and video - please feel free to edit/remix/repost". So here's my quick edit of what they've posted so far - I'll try to do something similar if they post more in the coming days. The video features people from UNOSAT and UN OCHA explaining how useful OpenStreetMap data was to them - and also some clips from a prayer march. Click through on the video to see a larger version (and choose 480p). Catherine from OCHA (the UN Office for the Coordination of Humanitarian Affairs): "Basically it's the best source of transportation information that we have for Haiti ... it's the most comprehensive one, and the most up to date, of course. This is information that everyone is using here. There is a big GIS group here for this humanitarian response, and everybody is using OpenStreetMap." Schuyler: "OpenstreetMap was used for the UNOSAT building damage assessment ..."
Olivier from UNOSAT (UN Operational Satellite Applications Programme): "Of course we used OpenStreetMap on a daily basis ... every day it was possible to improve our maps ... with new information. Usually it is impossible to get this information ... so thanks to this volunteer platform, it has been fantastic for us, that's for sure." On Wednesday next week, there will be an informal meetup at the Wynkoop Brewing Company in downtown Denver, to drink beer and discuss OpenStreetMap. 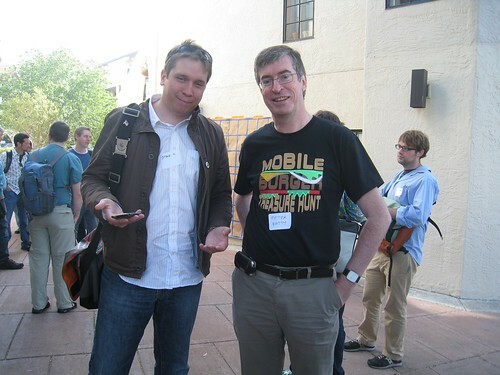 Steve Coast, the founder of OpenStreetMap, will be there, and it should be an interesting group of local geo folks. We'll be there from 5:30pm until 9ish or later! If you’re already involved with OpenStreetMap, this is a chance to get together with other contributors and discuss ideas – I would love to see us having more coordinated initiatives in the Denver area than we’ve had so far. And if you haven’t been involved but are curious about OpenStreetMap, this is a great opportunity to learn more. Hope to see a good turnout – please sign up here! That's Steve and me in the photo above by the way, to help you track us down if you don't know us!